Rotherham-based developer, E V Waddington Ltd, specialist in brownfield development, continues to successfully bring speculative developments to the South Yorkshire market. A leader in speculative development, Waddington provides the region with industrial, commercial and office accommodation to let. Sheffield South East MP Mr Betts recently visited the newly completed Vantage Park, built with £1m funding from the European Regional Development Fund (ERDF), to meet developer Tony Waddington and property agents Knight Frank. Located close to Junction 34 of the M1, four units remain from the ten built in the already established commercial location. British Glass, Plascompo, Prosurface, Cafeology and Interlink have all located to Vantage Park. 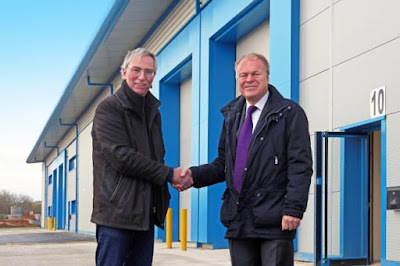 Clive Betts MP (pictured, right), said: "This is exactly they type of modern industrial usage we want in the area offering crucial employment opportunities through the regeneration of the area. This park is already home to five new tenants. This success shows that speculative development is worth doing here and business owners see the value of being located in Tinsley." Rebecca Schofield, partner at the Sheffield office of Knight Frank who helped provide market advice to secure the ERDF grant and which is marketing the development, said: "Waddington's saw the need for a new industrial park to cope with increased demand for manufacturing and industrial use in the area and built the development speculatively. "We have seen sustained demand from the industrial and manufacturing sectors in the South Yorkshire region for small to medium sized good quality stock which the development at Vantage provides." The remaining four units are available individually or can be combined to accommodate larger requirements. The site also sits within Sheffield City Region Enterprise Zone where capital allowances are available to qualifying occupiers. EV Waddington operates its own construction company and other local developments include Aldwarke Wharf, where plans have recently been approved for the next phase. The company's first development in the 1950's was for KP Nuts, a canal side development for taking delivery of peanuts at Eastwood.